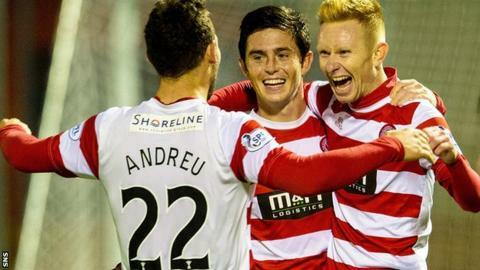 Hamilton Academical beat struggling St Mirren 3-0 in the Scottish Premiership thanks to goals from Tony Andreu, Mickael Antoine-Curier and Ali Crawford. Hamilton manager Alex Neil: "Particularly after we got the second goal we started knocking the ball about and playing some really good football and were back to being what we were renowned for at the start of the season. That isn't easy, it isn't easy to play that well and win games at this level. "We had to work hard. The first goal was crucial for us because up until that point we had two or three opportunities and we didn't take them. The longer the game goes the more you worry that they might nick something. "I thought it was a dominant performance from us, the only down side was once we went 3-0 up we became a bit slack and St Mirren threatened with two real good efforts that hit the woodwork. "Over the piece we thoroughly deserved our win. "The message has still been the same, but to try and maintain and play as well as we had done for the first 10 games or so was always going to be difficult to do that over the course of a season. But I thought we got back to that today. "We know what we're capable of doing, the message has still been the same, we play the exact same way and the pleasing thing is we cut out a lot of mistakes today, that we've had in recent weeks. "Grant Gillespie was my man of the match today, I thought he was excellent. We were terrific middle to front, and we had a lot of opportunities where the final ball wasn't as good as I'd have hoped, but if it's on the money every time you'll be scoring 10 goals a game. "I'm delighted for the lads because it's been difficult the last couple of games." St Mirren manager Tommy Craig: "I was in search of goals which again haven't come our way. That's not to say we didn't try, we hit the bar twice and had a couple of efforts late on. "I thought the first half was relatively even. Just before half-time they got the goal and they came out with their tails up and they made it more difficult in the second half. "In the end they were quite dominant over the piece, so I'm really disappointed with how we played. "We didn't really get a foothold in the game at any time, or control it at any time, but I don't think they did either in the first half. But the second half they were the better team. "I'll work my hardest from Monday morning onwards to make things right."